Choosing a camouflage wedding dress is a statement, it could be because you are marrying someone in the military or you love the outdoors and love to hunt. Whatever your reason and it could be just because you love the idea, you will find that it is quite hard to find camo wedding dresses. Camouflage is big in the United States so if you are in the US you will probably have already heard about Mossy Oak which is a big brand for outdoors and hunter camouflage. Go on their website and you can buy camouflage tops, caps, hats but no dresses. What do you do? The first choice is to buy the material and make your own wedding dress, you could have any style you want from a traditional big wedding dress to something more practical for the outdoors. This amazing camouflage dress has been made by the designer Gary Harvey from 28 army jackets. This dress is a showcase to recycling and what can be created from items that others no longer use, which could be a motto for all of us cheap wedding solution brides! If making your own wedding dress is not for you (it wouldn't be for me either) then you need to find a good supplier and also one that is cheap but gorgeous! The normal wedding shopping rules apply when you are looking for a bargain dress. 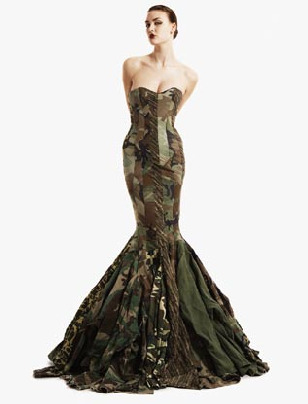 First, can you find a great prom dress in camouflage that would be perfect for your wedding and cost you a lot less? as they have a lot of great Camo wedding and bridal dresses and accessories to choose from and the prices are great too. It doesn't have to be a full on camo dress but trimmed in camo would work really well. If your future husband is in to hunting and you are not, then having a more subtle look could work really well for both of you. 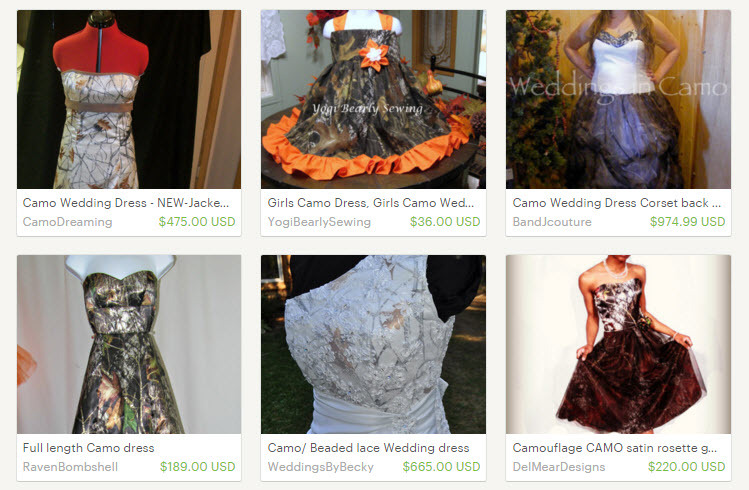 Also have a look at these great Camouflage Wedding Dresses available on Etsy. Click on the wedding dresses below that you like for more information. Instead of going for a Camo wedding dress you could instead find your dream dress and have the Camo accessories added to it. This could be as simple as a Camo sash.